Like so many throughout the world, we felt shock and ineffable sadness on learning of our Holy Father's abdication today. The quiet, scholarly Bavarian Pope has been a great and historic helmsman for the bark of Saint Peter. With his restoration of the Extraordinary or Tridentine Mass, he has healed wounds that festered for decades and ended nearly a half century of turmoil and alienation that followed the Second Vatican Council; he has built trust and collaboration between the See of Peter and the churches of Constantinople and Moscow; he has healed divisions between Anglicanism and Catholicism and provided a bridge across which disaffected Anglicans, Lutherans and other Protestants could return to the historic Church and keep the beautiful patrimony of their traditions; he has ensured faithful translations of the Roman Missal and reverent liturgies, he has reminded Catholics of the "hermeneutic of continuity" and restored our beautiful traditions and devotions. With superb ecclesiastical appointments, personal example, brilliant teaching and the invocation of a special Year of Faith, he has refocused a bureaucratic and self-focused Church into a dynamic, renewed and evangelical Catholicism that is reaching millions in Africa and Asia, while offering a radical, counter-cultural vision to the youth of historically Christian nations. He has spawned a wealth of vocations among generous young people who know the emptiness and the despair of hedonism and secularism and want to live their lives, like that of their Pope, in radical service to Jesus, the Gospels and the salvific mission of the Church. Perhaps the Holy Father's greatest gift is that of a teacher. In countless letters, encyclicals, homilies, reflections and books, Pope Benedict has presented the Word of God, difficult theological issues and doctrine in ways that are not only clear and relevant to modern men and women, but in ways that profoundly touch their hearts and compel action. It was shocking to learn that for the first time in over 700 years a Pope will abdicate his position as Supreme Pontiff. We believe that popes and monarchs are far more than chief administrative officers, important for what they do, but rather God-chosen leaders, spiritual leaders, important for what they are and represent. 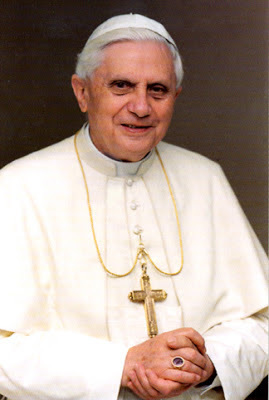 Pope Benedict is Christ's Vicar on Earth and the successor of Saint Peter, the first Pope, but he has shouldered that awesome responsibility with humility, kindness and a profound love for the Church and all of its members. We wish he would stay and continue a dutiful and brilliant papacy for many, many more years; but even in relinquishing the Petrine Office, this gentlemanly and holy Pope provides new insights about life lived radically in service to Christ and His Church. He has acted with humility and as a loving shepherd not only for her more than a billion professed members, but to all mankind who, whether they recognize it or not, have been entrusted to his care and are the objects of his love, prayers and service. We know that the Holy Spirit will provide the Church with the right Pope for the years ahead, but the 265th link connecting that papacy with all those before it, right back to Saint Peter, will always be remembered for his brilliance, holiness, glorious restoration and renewal. Thank you, Holy Father, for your example, faithful teaching, for all that you did to restore and renew Christ's Church for a new and challenging era in salvation history. May God richly bless you and honor you, in this life and the next, for being a good and holy shepherd.